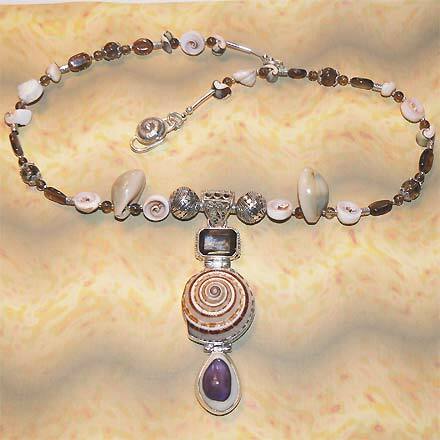 Sterling Silver Shell and Smoky Quartz Necklace. See Closeup. Sterling Silver Shell and Smoky Quartz Bracelet. 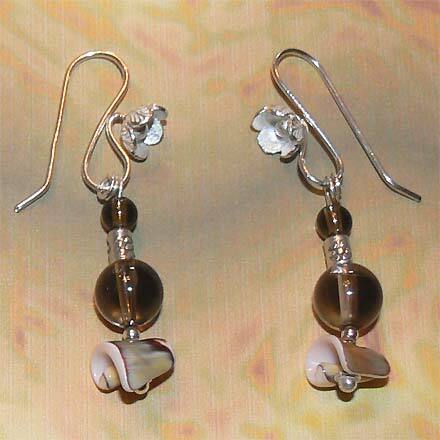 Sterling Silver Shell and Smoky Quartz Earrings. My media of choice in jewelry is semi-precious stones. In my other life, I'm a visual artist--a painter--and stones are like my paint. But sometimes you just have to experiment with a different medium, and then you discover the incredible worlds it has to offer. 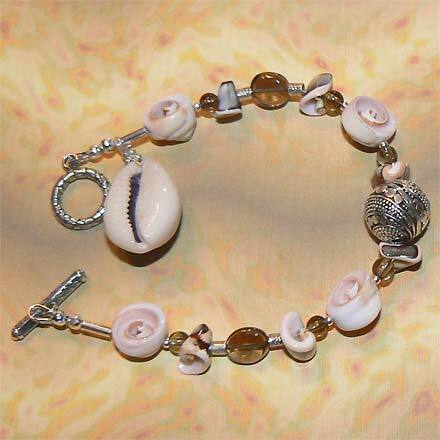 As I was composing this page, I was looking on the internet to identify the various seashells I used in this jewelry. In doing so, I discovered the world of seashells and their amazing beauty. Hopefully I will be returning to this medium more. I still haven't identified the small pink and brown spiral shells (some kind of sea snail? ), but I think the small round conical ones are little Sundials. 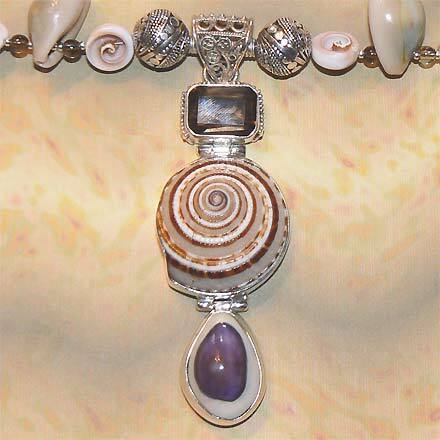 The bracelet also has a Cowrie that dangles, and the necklace sports an amazing pendant with a purple-backed Cowrie and a gorgeous larger Sundial. Smoky Quartz also adds to the mix. Speaking of art, I find it ironic that those who make their living in teaching university-level art are stuck in the "do not use colors not found in nature" mindset, yet at the same time also dislike the use of spiral imagery. Why? Because it's not found in nature? Whatever! For those who are interested in birthstones, Smoky Quartz is associated with Sagittarius.